Envistar Home Concept is a range of centrally located, highly efficient FTX units tailored specifically for blocks of flats. Customised control equipment and a wide range of fans, motors and heat recovery units provide everything you need for energy optimised air handling. Do you need to improve the ventilation in your property or are you constructing a new build? 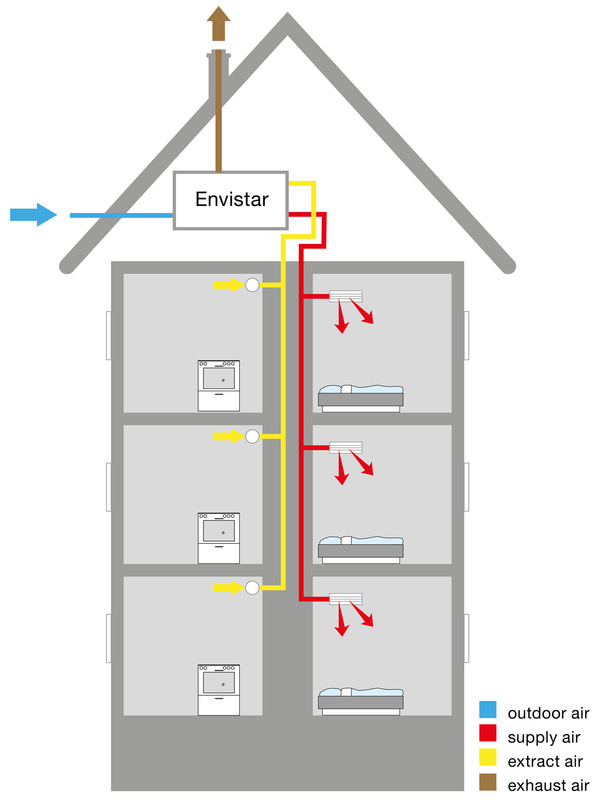 In which case, we would recommend the Envistar Home Concept unit, tailored specifically for blocks of flats. The central location of the unit facilitates service and supervision. It reduces your costs and you do not need to disturb any tenants to carry out servicing. High efficiency means that the heat recovery must be above 80%, dry temperature efficiency. In addition, the fans that drive the unit have a very low SFPv value. Fresh air is brought in via trickle vents in window frames. Extract air is extracted through valves in bathrooms and kitchens. The heat in this system is not recovered but disappears straight out through an extract air fan. Fresh air is brought in via slot valves in window frames. Extract air is extracted through valves in bathrooms and kitchens. The heat in this system is recovered through an external heat pump, which is connected to the extract air unit via a brine system.